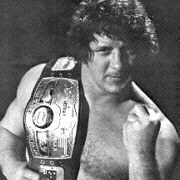 Terry Funk was very busy in the Mid-Atlantic territory during the first half of 1976 and then avoided the territory until coming back for a series of defenses around Thanksgiving. Funk's main challengers were Wahoo McDaniel, Paul Jones, and Rufus R. "Freight Train" Jones. While this list is close to complete, we believe we are missing a few title matches. If you have information on an NWA title match we don't have listed here, please let us know at the Mid-Atlantic Gateway.